Despite many ongoing efforts on energy efficiency improvements in data centres, the lower energy consumption per data centre does not compensate the cumulative increasing energy demand, due to the combined action of increasing load density in the computer room and rising digitization of human activities. Hence data centres are consuming increasing amount of energy, with a significant negative impact on the environment (increased carbon emissions and global warming), and on power supply continuity. Large data centres have started taking initiatives to operate their cloud‐scale data centres with renewable energy due to the attractive in‐place incentive systems. As a concrete answer the GEYSER project aims to step well beyond today’s Green data centres sustainability efforts by researching and delivering an innovative conceptual and software framework aimed at improving and trading‐off local energy efficiency and carbon reduction footprint against a broader system‐level smart city energy efficiency, while maximizing the use of renewable energy. 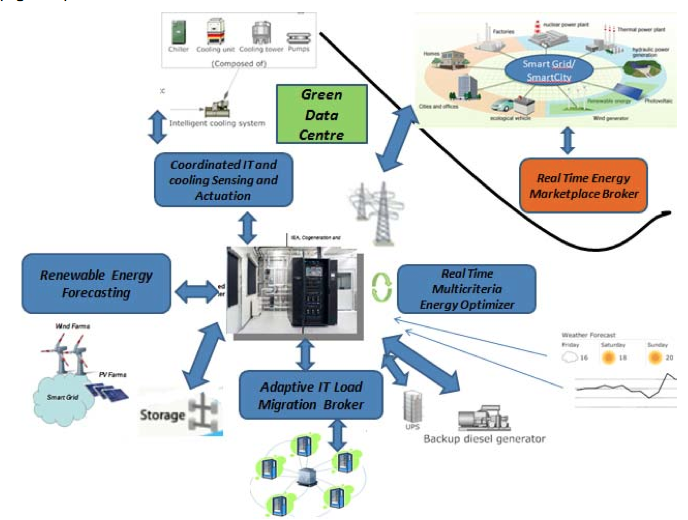 GEYSER will originally combine real time smart synergistic IT infrastructure (computing, storage), cooling and power subsystems monitoring and control, with flexible supply/demand load and energy management within green energy‐led marketplaces and geographical renewable energy supply‐ aware load balancing. GEYSER future green data centres will be able to monitor, control, reuse and optimize their energy consumption and production, from renewable energy in particular, within the framework of a holistic representation of energy (either power or heat) and along the underway roadmap towards acting as energy prosumers. The ICCLab will play a lead role in developing workload migration mechanisms which will not affect perceived customer experience. GEYSER will be validated in two different operational urban data centres pilots, located in Italy and the Netherlands (Amsterdam), partially powered by renewable energy. Expected outcomes will be beyond‐SoTA values for energy efficiency metrics, i.e PUE below 1,20 and CUE and ERE improvement by 30% in average. This entry was posted in GEYSER, Projects by TMB. Bookmark the permalink.